The Darjeeling Tea Association today said planters were forced to pay wages in cash because of non-cooperation by banks though most workers had opened bank accounts. Bankers said there was a "huge exercise" to be completed to help tea gardens pay wages to workers through accounts and it would take more time. 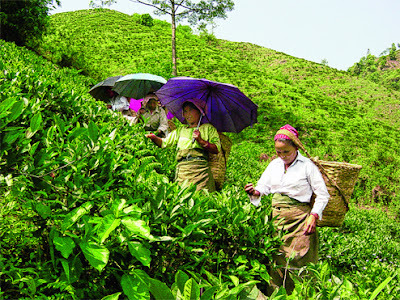 "Almost 80 per cent of tea garden workers in the hills have bank accounts now. However, many gardens are forced to pay wages in cash as accounts of a lot of workers are not yet operational. We have information that some banks have confidential internal communications, directing local branches not to entertain garden workers," said Sandeep Mukherjee, the principal advisor to the DTA. The hills have 87 tea gardens which employ around 55,000 permanent workers and 10,000 temporary labourers. "The gardens are to set up Customer Service Points and appoint Customer Service Personnel who will liaison with tea garden workers and the bank. Many banks have not yet appointed the personnel. New ATMs haven't been set up in the hills either," alleged Mukherjee. He said many banks demanded that the workers' accounts be opened in a tea estate's principal bank. "However, many principal banks which are in Calcutta do not have branches in the hills," said the DTA representative. The association has asked tea gardens to collect specific instances of non-cooperation by banks by April 5 and compile a report. "We will send the report to the Prime Minister's Office and the finance minister," said Mukherjee. The associations fears that the industry might be hauled up by the Centre for failing to follow its directive to credit wages to workers accounts. Some bank officials said it was unfair to criticise the lenders in general. "Some banks have set up Customer Service Points. Some might not have done so. As far as I know, there is no confidential communication asking us not to entertain garden workers," said a banker who didn't want to be named. "All paper works need to be right for an account to be activated. In many cases, the papers works were not properly done and hence, there is the delay. There is pressure on the bank infrastructure and for such a huge exercise to streamline, it will take more time," said the banker. Another banker in Darjeeling attributed the delay in activating accounts to workers' lack of "banking knowledge".